YouTube released a campaign! But, after watching we have more questions than answers. Check out the ads below and see what YouTube’s goal was behind the launch of this ambiguous campaign. Now that you’ve seen the ads, any guess what YouTube is promoting? Cooking? Baking? Making your own YouTube channel? Your guess is as good as mine. I’m unsure of the campaign’s goal and how it’s benefiting YouTube as a brand. However, the spots work nicely for the featured YouTubers who are on the commercials and subways around the country! The goal of this campaign was to increase advertising purchases on the top 5% of YouTube content, giving advertisers the opportunity to hit a large audience with specific interests. YouTube featuring some of their biggest personalities in the ads makes sense, but YouTube could’ve made their message more clear. After watching these ads you could be inspired to make a Pacman cupcake, but purchasing ad space on these channels may not come to mind. If YouTube showcased businesses running ads and people flocking to their stores with increasing sales, the audience would get the message and advertisers would be hooked. 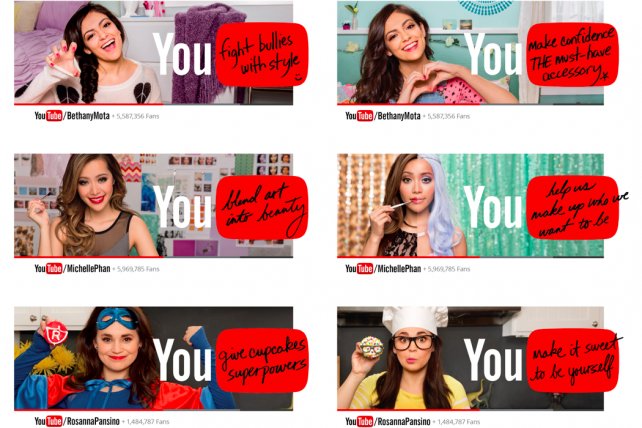 YouTube is a brand that doesn’t have a strong voice – and this campaign didn’t change that. YouTube offers numerous benefits to advertisers that aren’t showcased in this clip. YouTube’s variety of channels allows for a brand to easily reach their target market and potential customers. YouTube is designed for sharing content. If you have great content – people will share it! Or, in this case, if you have bad content – people will share it! YouTube is accessible from phones and computers, so your message can be seen just about anywhere. If you’re still finding your brand’s place on YouTube, talk to DC Interactive and go viral!